I moved to Rome in the fall of 2015. I had finished culinary school and was there to intern in a kitchen at an academy for American scholars. My first visit was three years earlier while I was living in Florence. I was there to meet a lover for the weekend. Together we trounced through the city hand-in-hand, high on that uniquely evanescent energy born out of sexual attraction. There’s a sensuousness to the city that matched ours: A cheesemonger once implored me to try his pecorino romano before slicing off a piece and hand-feeding me. My experience of the city then mirrored my emotional landscape: pulsating, incandescent, alive. Rome in that epoch was an all-night bender, wholly unsustainable, but endlessly intoxicating nonetheless. Upon returning, I came to relate to the city differently. I peeled back layers that revealed a complicated and endlessly fascinating history. Our relationship matured into an enduring love, strong and muscular, reinforced by a sincere appreciation for the rough, carnal beauty embedded in the traffic, the graffiti, the gruff and impatient taxi drivers. The contours of small back alleys, most of which weren’t marked on maps, became so familiar I could trace them with my eyes closed, like following the lines on the palm of a partner’s hand. Rome became a Home of sorts, a place I felt myself returning to in my mind long after I crossed back over the Atlantic. I lived in an airy apartment on Via Angelo Masina with three other cooks. Our apartment was on the third-floor of a smaller building adjacent to the academy. The kitchen was shaped like a small rectangle, so narrow that only one person could stand at the stove at a time. Our pots were made with horribly thin aluminum that scorched the devil out of whatever you tried to cook in them. I mostly stuck to repurposing cold leftovers with a softly fried egg on top – mercifully, we did have one small nonstick pan. I ate lots of yogurt and jam for breakfast and was constantly brewing coffee in a Moka. We kept the windows open most of the time. The sound of our neighbors’ kids playing in the backyard comingled with someone playing a piano nearby. That quickly became the soundtrack that narrated my days. I got to know Rome more intimately by getting lost on long, directionless walks and early morning runs that often included a loop along the Tiber. I loved watching the morning mist gradually rise off the river as my feet quietly struck the pavement in time with my breath. One of my favorite running routes snaked around the outer walls of Vatican City. At dawn it was quiet and desolate. I would pause to stand in the center of St. Peter’s Square, alone but for the flock of seagulls scrounging for trash and the lone sanitation worker sweeping up stray pieces of papers. The sunrise slowly ascended behind me, laying a golden carpet of light down Viale della Conciliazione, beckoning me straight to the doors of the Basilica where the Pieta waited to receive me and all my burdens. The kitchen at the academy was a wonderful place to learn. Designed to bring people from all backgrounds to learn more about seasonal cooking, it was, at its core, a teaching kitchen, which meant there was ample room to make mistakes. I learn best by doing, especially when I mess up. One time I carelessly seasoned a tray of romanesco before roasting it. The chef called me over and pointed to large clumps of salt that had dried out in the oven and gathered together in unsightly clusters on the florets. “Do you want to eat this?” he asked, slightly incredulous. “Oh, no” I nodded in embarrassment. “Always season from high above,” he said before throwing the whole tray in the compost bin and walking away to put out another (metaphorical) fire. This is where I learned to roast vegetables, a technique I use almost every day now. Always season your vegetables from high up. Use a bowl and jostle the vegetables well to be sure the salt gets evenly distributed. Roasting with convection is your friend. There are few simpler and more satisfying joys than snacking on perfectly roasted broccoli – crispy on the tops, creamy and supple stems, just the right amount of salt. Domenico, the Calabrian sous chef, taught me how to use leftover roasted vegetables to make ripassata di verdure, an truly ingenious soup: Gather together all the roasted vegetables you have on hand (so long as they’re not dressed with vinegar). Dice an onion and sweat it in a generous amount of olive oil. Add the vegetables, a bouquet garni of bay leaf and thyme and a large pinch of salt. Simmer for 30 minutes before taking it off the heat and letting it rest. Blend with a stick blender (remember to remove the bouquet!) or a food mill with the largest holes. Serve in a wide bowl with a large slick of olive oil and a knob of crusty bread. This is also where I learned to cook pasta. Most pros will tell you the secret to creating the silky smooth glisten that clings faithfully to the noodles like a warm pair of gloves is the right amount of pasta water coupled with vigorous tossing (a small pad of butter at the very end is always helpful). Kind of like knowing how much ice water to add to pie dough, knowing how much pasta water to add to get the sauce to the right consistency is best learned through trial and error. Especially with tomato sauces, the pasta does well to cook for 2 or 3 minutes in the sauce before tossing and finishing on the plate. Certainly a well-written recipe can give you guideposts for what to look for at each stage of the process, but I didn’t begin to appreciate the meaning of “vigorous tossing” until I practiced it with my hands. 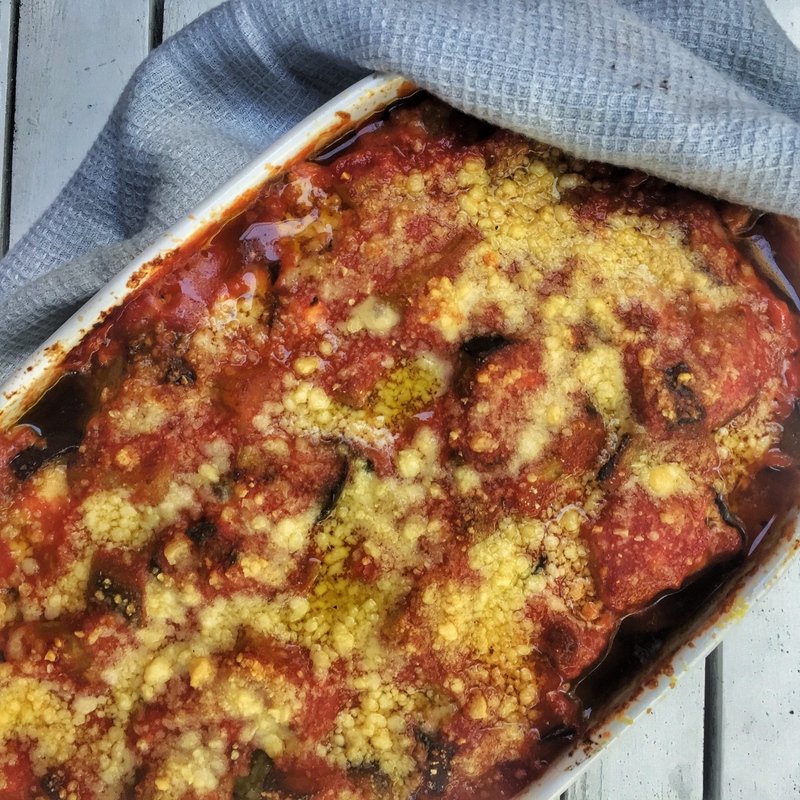 I learned this recipe for eggplant parmesan from Chris Behr, who was head chef at the academy during my time there. It bears no resemblance to the fried calorie bomb you’ll find at Applebee’s. 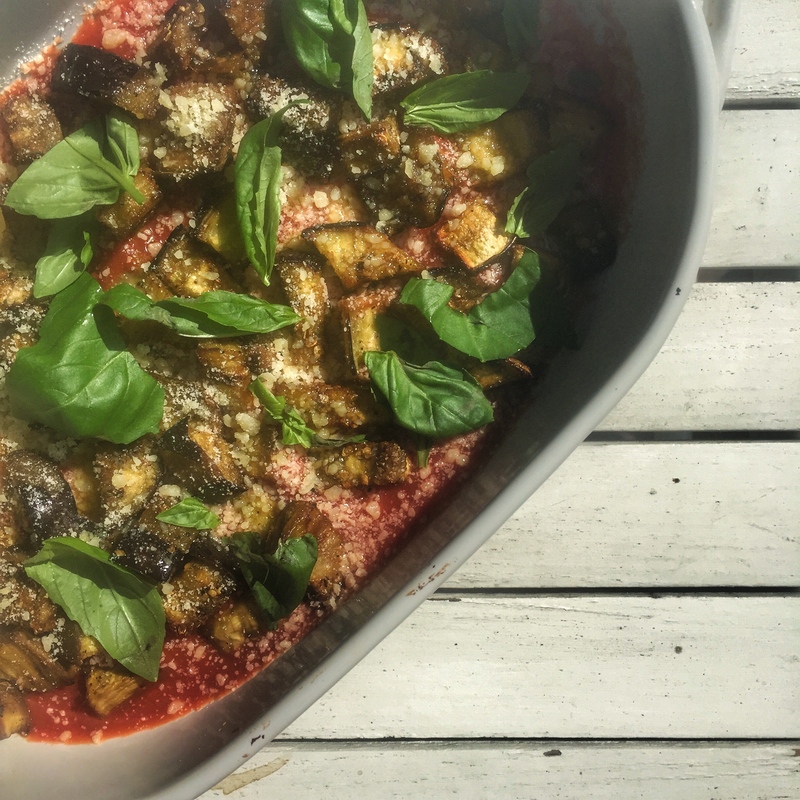 The eggplant is cubed and roasted until meltingly tender then layered in a gratin dish with milled tomato, fresh basil and grated parmesan. I made this recently and was hit with a wave of nostalgia for my other Home. On the second night of leftovers, I decided to reheat a portion and toss it into warm pasta. (Note: reheating the baked parm in a skillet can be perilous as there’s lots of cheese in that mixture. If you want to make this into a pasta sauce, use a non-stick skillet and reheat the sauce as quickly as possible to prevent scorching). Toss the eggplant with a large pinch of salt and a heavy drizzle of olive oil. The eggplant cubes should be well-coated in olive oil lest they dry out. Spread them out evenly in one layer on two parchment-lined sheet trays. Roast until tender, about 45 minutes. Let cool while you gather the rest of the ingredients. Using a medium-sized gratin dish, start with a nice slick of olive oil on the bottom of the dish, followed by a ladle or two of tomato. The bottom should be fully covered with tomato. Add a generous layer of cooked eggplant, a drizzle of olive oil, some torn basil and a handful of parmesan. Repeat two more times until you have three layers of eggplant. Finish with parmesan and a large drizzle of olive oil. Cover tightly with foil and roast for 30-40 minutes, until bubbly (depending on how big your gratin dish is). Uncover and broil for 3-5 minutes to brown the cheese. *Striping the eggplant just means peeling off strips rather than peeling the whole eggplant. I like to do this because sometimes the skin can toughen during roasted, plus it can have a bitter after-taste. I like some skin but too much as it tends to get stuck in my teeth. Striping is not required if you’d rather leave the skin fully in tact. I'm a cook, a writer, and passionate lover of red lipstick. I share stories and simple recipes here that narrate my life. I am forever indebted to cooking for teaching me how to love, how to live creatively, and what it means to feel truly satiated.